The graphic designer Onni Vuori studied at the Institute of Industrial Arts from 1954 to 1957. After completing his studies, he got a job at the advertising agency Viherjuuri. In 1960, Vuori moved to the advertising agency Lintas. The same year he drew a poster of a steamboat which received first prize in the Finlandia poster competition in the travel category. Vuori remembers that he got the idea for the steam-boat motif after having participated in a regatta on Lake Saimaa. He had been charmed by the old steam-boats he saw there. 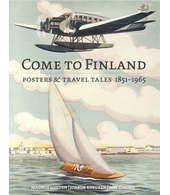 One gentleman, Vuori’s former boss Matti Viherjuuri, saw unthought-of possibilities in Vuori’s Finlandia poster. Acting more or less on his own authority, Viherjuuri had two new versions of the posters printed. This was in 1964, just after Finland had sent UN forces to the dangerous divided Cyprus. Matti Viherjuuri created the motto ‘Friendly Finland’ and then had it translated into Greek and Turkish. He had both a Greek and a Turkish version printed and the posters were donated to the Armed Forces. The Finnish UN soldiers on Cyprus then posted Vuori’s placards both on the Greek and Turkish side in order to awaken sympathy for Finland. In the advertising magazine Mainosuutiset 6/1964, there is a picture of three smiling Finnish soldiers drinking lemonade in front of a wall with a Greek version of the poster. Onni Vuori continued to work as art director at various agencies, including the Finnish advertising agencies of Ilmo, Erva and Interplan. In 1983, he got a job at the advertising agency Mainosyhtymä Oy, where he stayed until he retired in 1991. Since then Vuori has worked chiefly in heraldry.